An important Monegasque delegation accompanied HSH Prince Albert on Monday, June 8, 2015, to participate in the World Oceans Day celebration at UNESCO headquarters in Paris. For this annual United Nations event, the Inter-government Oceanographic Commission of UNESCO , in partnership with the permanent Delegations of Monaco and France of this organization, plus the Platform “Ocean and Climate 2015” – of which the Prince Albert II Foundation and the Oceanographic Institute are members – organized a thematic meeting on the interactions of the Ocean and the climate system, just a few months before the upcoming Climate Conference in Paris (COP21). Accompanying Prince Albert were: Mr Gilles Tonelli, Minister of Foreign Affairs and Cooperation; H.E. Ms Yvette Lambin-Berti, Ambassador, Monaco’s Permanent Representative to UNESCO; H.E. Mr Claude Cottalorda, Monaco’s Ambassador to France; H.E. Mr Bernard Fautrier, Vice President and Managing Director of the Prince Albert II Foundation; Anne-Marie Boisbouvier, Advisor in H.S.H. the Sovereign Prince’s Cabinet; Mr Jean-Philippe Vinci, Advisor to H.E. Ms Yvette Lambin-Berti; Ms Anne Fantini, Monaco’s Deputy Permanent Representative to UNESCO; and Mr Tidiani Couma, Secretary for External Relations in the Department of International Relations. Through scientific workshops, in which Mr Allemand, Mr Gattuso and Mr Cuvelier, among others, played an active role, along with round tables and exhibitions, this event provided an opportunity to bring together scientific experts, political decision-makers, representatives of civil society and young people. The aim was to attract attention to the impact of the oceans as a major source of oxygen and a regulator of the climate. It was also a chance to mobilize the international community on the issue of sustainable management of the oceans. The day concluded with the delivery of the “Paris Appeal”, recommending the inclusion of the oceans in the future climate regime, to the senior political figures who attended the event, including H.S.H. the Sovereign Prince; Mr Laurent Fabius, the French Minister of Foreign Affairs and International Development; the President of Palau; the Vice President of the Seychelles; the Prime Minister of Barbados and the European Commissioner for the Environment, Maritime Affairs and Fisheries. On this occasion, Prince Albert reiterated his full commitment to the current negotiations, whether on the status of the high seas or the adoption of a Sustainable Development Goal specifically for the oceans. On the occasion of the World Oceans Day and associated ceremonies hosted by the IOC-UNESCO in Paris, the Scientific Center of Monaco (CSM) in collaboration with the International Atomic Energy Agency (IAEA) launched two major publications on the biological and socio-economic impact of ocean acidification. These documents represent two of the outcomes of the series of international workshops on the socio-economic consequences of ocean acidification. The first document is the brochure summarizing the objectives, conclusions and recommendations for policy makers formulated by the participants of the 3rd International Workshop organized by the CSM and the IAEA at the Oceanographic Museum of Monaco January 12-14, 2015. The second publication presents the overall report compiled by the participants of the 2nd Socio-Economic Workshop, addressing ocean acidification impact on fisheries and aquaculture on November 11-13, 2012 in Monaco. The hidden effects of the acidification of the oceans on the corals, that were unveiled by a research team from the Scientific Center of Monaco (CSM in French), were published on June 12 in the prestigious British revue “Nature Communications”. The title of the publication is : “Morphological plasticity of the coral skeleton under CO2-driven seawater acidification”. Eric Tambutté, Alexandre Venn, Michael Holcomb, Natacha Segonds, Nathalie Techer, Didier Zoccola, Denis Allemand and Sylvie Tambutté. 2015. Nature Communications. The results of their study confirm the ongoing decrease in the pH of the Earth’s oceans, caused by the uptake of carbon dioxide (CO2) form the atmosphere. An estimated 30–40%of the carbon dioxide released by humans into the atmosphere dissolve into oceans, rivers and lakes, contributing to climate change and the acidification of oceans, with the inevitable impact on organisms and marine ecosystems. The creatures that are more vulnerable are those having a calcareous structure, notably mollusks and corals. The researchers from the CSM under the direction of Professor Denis Allemand, can be considered pioneers in this field, as they have been studying for many years the corals and the impact of environmental variations on the formation of their calcareous skeleton. 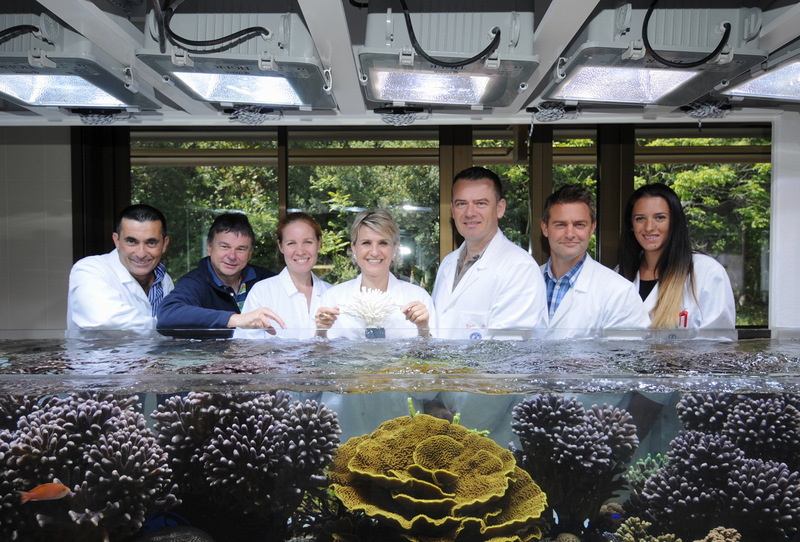 After five years the team of corals’ Physiology lead by Dr. Sylvie Tambutte have been keeping in an aquarium tropical corals in conditions mimicking the acidification of the oceans going to extreme acidification values that exceed those from the most alarming forecasts. Certain coral species die rapidly but one of them survived and even behaved indifferently to such a stress. Besides there was no visible difference between the control organisms and those going through the stress test, and the corals seemed to be doing well. But the microscope revealed what the eyes could not see: the architecture of the corals skeletons was profoundly modified becoming more porous, that means les resistant to the action of the waves. CSM Publication authors, L to R:Dr Didier Zoccola, Professor Denis Allemand, Nathalie Techer, Dr Sylvie Tambutté, Drs Éric Tambutté and Alexander Venn, Natacha Segonds. Absent : Dr Michael Holcomb. The team researchers, notably the two first authors of the publication, Dr. Eric Tambutte and Alexandre Venn, used a technic panel to characterize and understand the coral’s response to the acidification, combining microscopy, cellular physiology and biochemistry. Such arduous work was compensated by such a high level publication in the prestigious Nature Communications. The researchers remain prudent in the extrapolation of their results. In effect it is a laboratory experience, where only one of the parameters was variable, the acidity, but in the field there other parameters that interplay like light, oxygen saturation or nutrition that can either aggravate or neutralize the acidification effects. Despite everything the results show a sort of “resistance to acidification”, and a concealed sensitivity that will turn it even more fragile in increasing acid oceans.